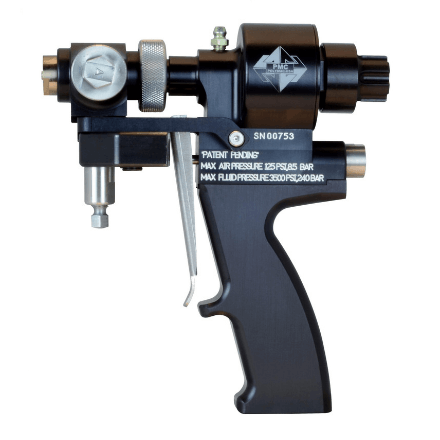 The PMC AP-2 Series Spray/Pour Gun incorporates a patent pending separate chamber and Pattern Control Tip (PCT) giving the option to create a variety of spray patterns as well as the ability to create different back pressures to custom mix foam and coatings. The PMC AP-2 Series Spray/Pour Gun incorporates a patent pending separate chamber and Pattern Control Tip (PCT) giving the option to create a variety of spray patterns as well as the ability to create different back pressures to custom mix foam and coatings. In addition, an adhesion resistant gun finish minimizes foam and coatings buildup on the gun body and hardened coated PCT and multi-directional PCT air blasters keep the tip clean. The AP-2 is the lightest, lowest priced US manufactured air purge gun on the market.The maximum output is 40 lbs/min (18kg) and maximum pressure rating is 3500 psi (245 bar). All PMC AP2 documentation, manuals and resources available HERE.